By using this link, Amazon donates to Morgantown High School Band Auxiliary. Do you shop at Kroger? If yes, have you linked your Kroger Rewards Card number to the Morgantown High School Band Auxiliary? You will need to create an account if you do not have one. You will find the band listed as Morgantown HS Red & Blue Marching Band or you can search for MY443. New cards for 2018/2019 are available now. 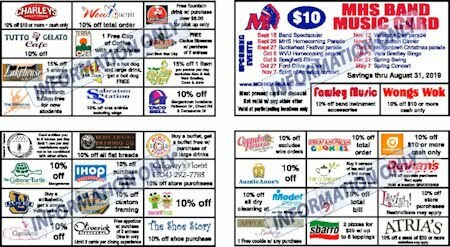 Discount cards will be available for purchase at MHS home football games and at all band events. Email the band at info@mohiganband.com or see a band family to get yours!! !